If you serve this Green Curry Tofu on Meatless Monday, chances are good they'll ask you to institute Tofu Tuesdays! Spread 1 Tbsp. curry paste evenly onto both sides of tofu slices. Heat oil in large skillet on medium heat. Add tofu; cook 4 min. on each side. Remove from heat; keep warm. Mix cream cheese product, coconut milk, water and remaining curry paste until blended. Add peppers and onions to skillet; cook 5 min., stirring occasionally. Stir in cream cheese mixture; simmer on medium-low heat 3 min., stirring constantly. Stir in cilantro. 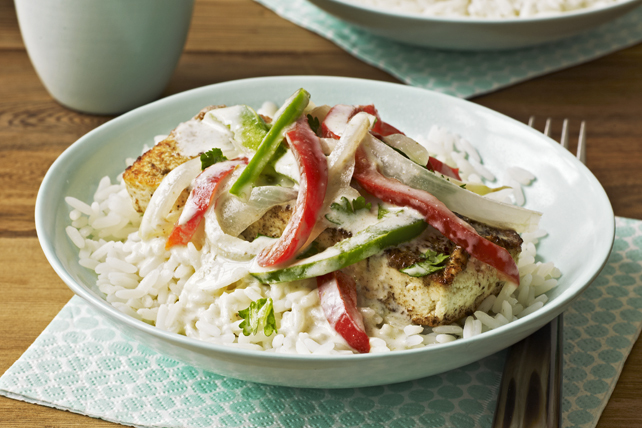 Serve rice topped with tofu and vegetables. Take a walk with your family after enjoying this meal together. Prepare using red curry paste. Extra-firm tofu is easier to cook with than the regular tofu. But it still needs to be turned over carefully so it doesn't break into pieces.